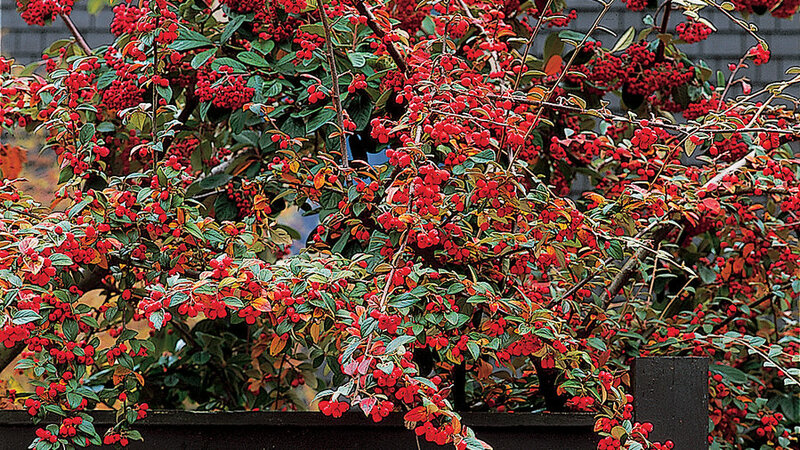 Plant one of these shurbs or small trees for a burst of color in your fall-to-winter garden. Some work well as espaliers, turning a blank fence or wall into a beautiful focal point. Their berry-laden branches are fun to pick for indoor arrangements. And wild birds love them. Fall is the best time to shop. Put them in the ground now or pop their nursery cans into larger containers for instant holiday displays for porch or deck. 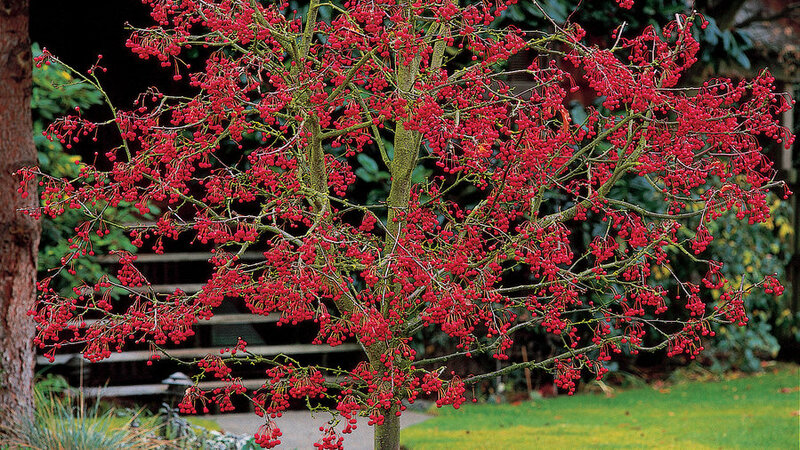 Pictured: Green hawthorn 'Winter King' (pictured). 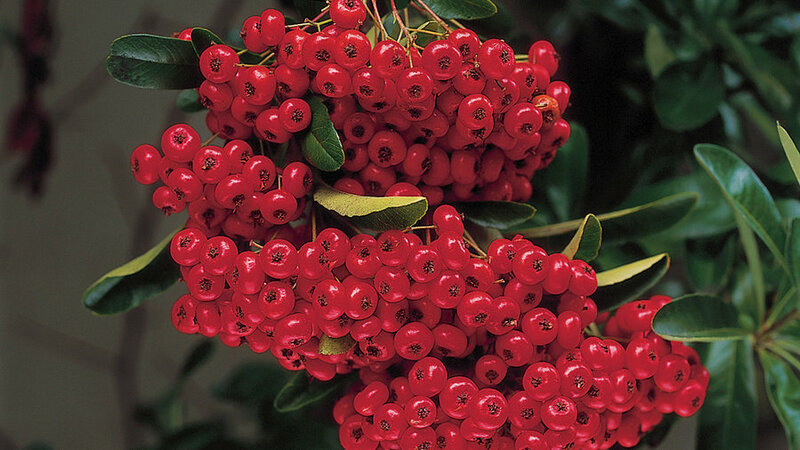 Masses of red berries are displayed on naked branches after leaves turn yellowish and drop. Grows 25 to 30 feet tall and wide. Sunset Climate Zones 2-12, 14-17. 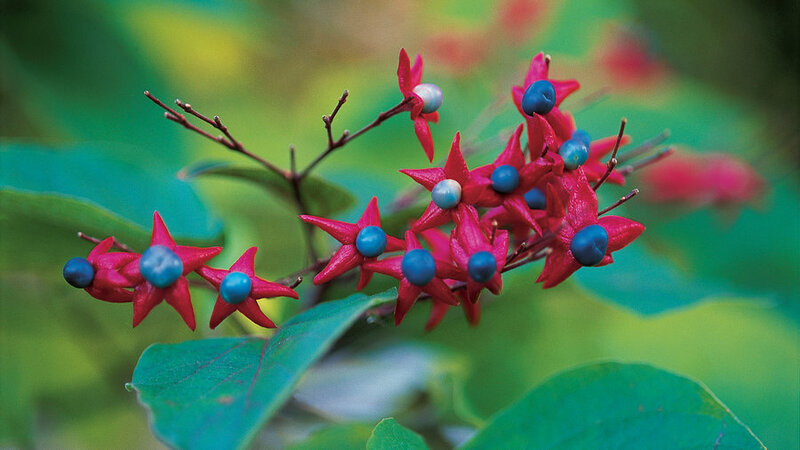 Shiny blue or turquoise berries framed by scarlet calyxes form in late summer and hang on after leaves drop. This deciduous shrub reaches 10 to 15 feet tall and wide. Partial shade. Zones 15-17, 20-24 (find your climate zone); can be grown in zones 5 and 6 but may freeze to the ground. Puffy fruits the size of olives turn from yellow when young to red when mature. The fruits are borne at the same time as urn-shaped flowers among dark evergreen leaves. The species ranges from 8 to 35 feet tall and wide; compact varieties reach only 5 to 8 feet tall. Full sun or partial shade (essential in desert areas). Zones 4-24. This deciduous shrub's other common name ― Himalayan pheasantberry ― hints at the appeal its fruits have for birds. The berries start out green but quickly turn red, then deep purplish black. Grows 6 feet tall and wide. Full sun or light shade. Sunset zones 4-6, 14-17, 20-24. Round clusters of amethyst to purple berries remain on bare stems after willowlike leaves turn color and drop. This easy-to-grow Western native looks good all year. 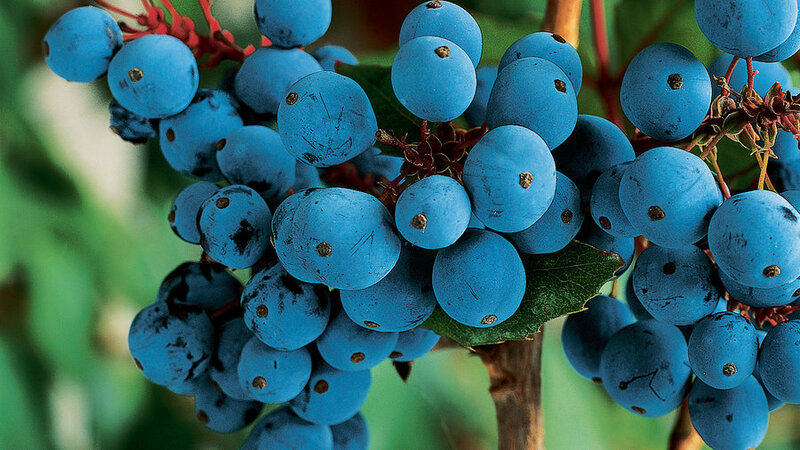 In fall, its clusters of yellow flowers are followed by berrylike, blue or blue-black fruit that birds love. Commonly called firethorn, this shrub bears clusters of red, orange, or yellow berries that are the size of peas. Glossy foliage is evergreen (semievergreen in cold-winter climates). C. lacteus (pictured). Clusters of red fruits last a long time among the dark green leaves of this evergreen shrub. Full sun. Zones 4-24. 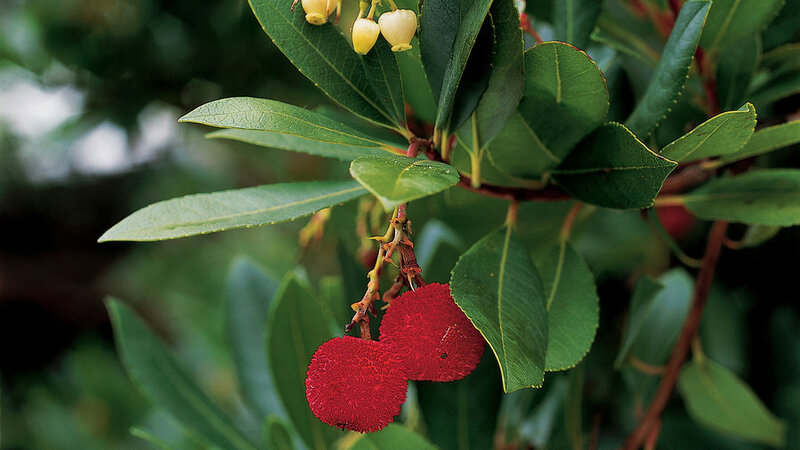 C. dammeri, or bearberry cotoneaster, displays bright red fruits among dark evergreen leaves. It reaches only 6 to 12 inches tall but will spread 10 feet wide and cascade down a slope. Full sun or partial shade. Zones 2-24. C. divaricatus. Bright red, egg-shaped fruits deck the branches of this deciduous shrub, whose dark green leaves turn orange red in fall. After the leaves drop, the berries last until the birds devour them. Grows 6 feet tall and wide. Full sun. Zones 1-24. C. horizontalis. Red fruits hang on after round green leaves turn orange, then red before dropping. 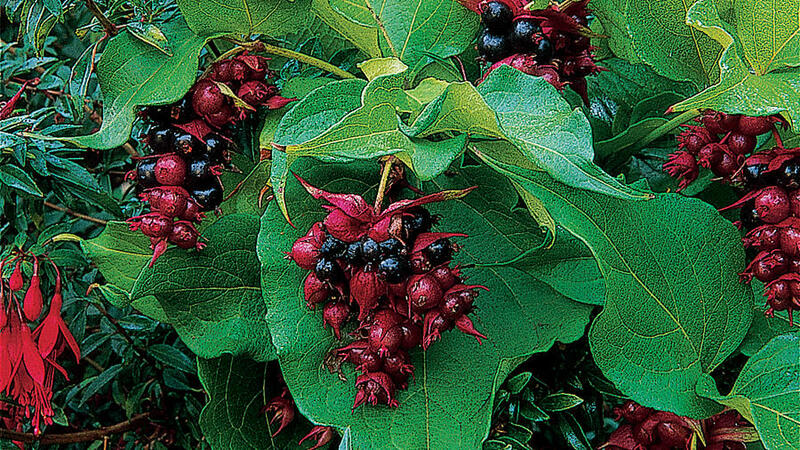 This deciduous shrub grows 2 to 3 feet tall and up to 15 feet wide. Full sun. Zones 2b-11, 14-24, A3.